Floats and has natural moving legs when twitched on top of the water. Use in weeds, lily pads and heavy cover. Designed to give maximum splash at slower retrieve speeds the Gambler Cane toad offers a very unique swimming action and the larger body holds a bigger hook. 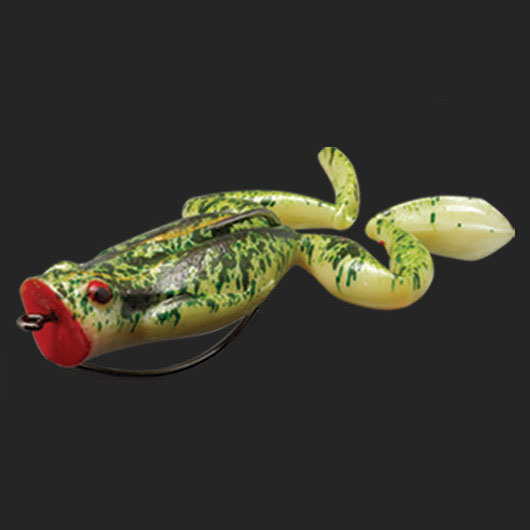 The Sensation action Frog is made from a durable, soft floating material. The lure is pre rigged with a wide gap hook perfectly suited to ensure the best hookup ratio. A specially moulded hook makes the lure incredibly weedless without sacrificing hook-ups. The material is extremely durable and won't tear easily like most plastic frogs. A cupped face allows the lure to be popped and the floating body allows the lure to be paused to induce more strikes. 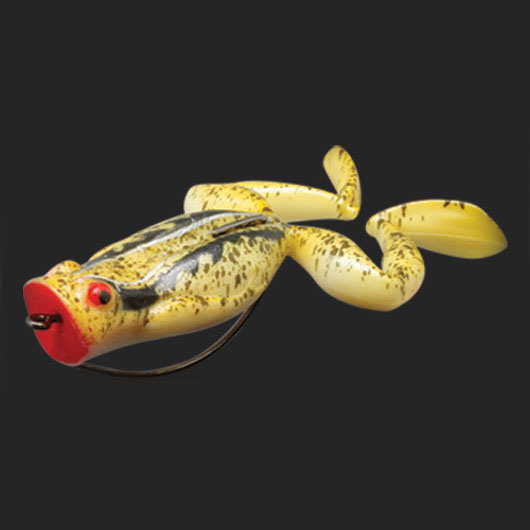 The Sensation action Frog is made from a durable, soft floating material. The lure is pre rigged with a wide gap hook perfectly suited to ensure the best hookup ratio. A specially moulded hook makes the lure incredibly weedless without sacrificing hook-ups. The material is extremely durable and won't tear easily like most plastic frogs. A cupped face allows the lure to be popped and the floating body allows the lure to be paused to induce more strikes. Not just another "Frog" but dynamic ElaZtech Hard Leg FrogZ with lively paddle-foot swimming action, up to 10X Tougher and they float... even with big hooks! There are darn few top water baits that can match the water movement of these lively popping FrogZ. Like all ElaZtech baits they float and will maintain a horizontal profile, even while motionless on the water. They pop, gurgle and push water with each rod twitch.